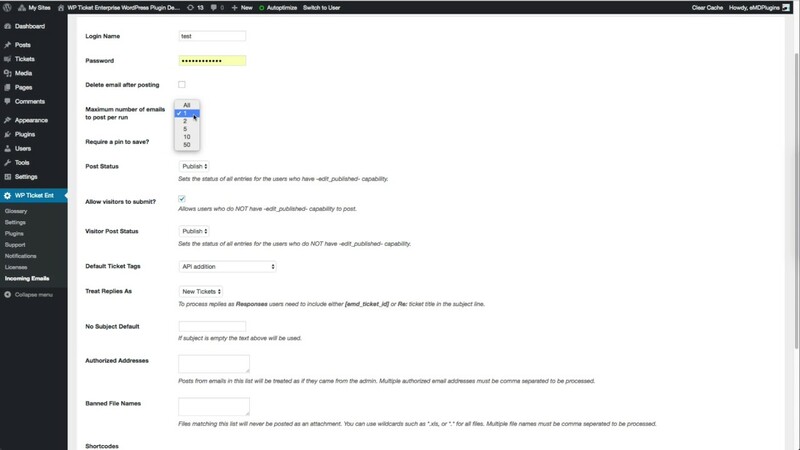 WP Ticket Incoming Email Addon lets you automatically turn your incoming customer support emails into support tickets. Manage everything in one centralized location and increase productivity and customer response time. Automatically convert user emails into customer support tickets. Protect against spam spam or unauthorized ticket creation using email pins, authorized addresses, and banned file names. Support IMAP or POP3 with or without SSL/TLS. Set intervals to pull your emails. Option to delete your emails after creating tickets. Option to set maximum number of emails to post. Allow visitors or only site users submissions to be created as tickets. Set default subject for emails without any subject line. Option to set separate ticket post status for site users and visitors. Using shortcodes to categorize emails or to set values. Email processing activity history is recorded for errors and/or validations.